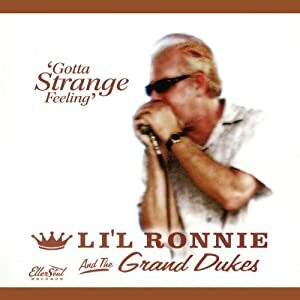 Li’l Ronnie is the consummate modern bluesman, a journeyman dedicated to his craft and devoted to the classic sound and undeniable power of a hard-driving blues band. With Gotta Strange Feeling, he delivers another collection of strong originals, most composed with the help of guitarist and long-time musical foil Ivan Appelrouth, with a couple of cool covers thrown in for good measure. Owens is a harmonica player in the old-school style, more concerned with the sheer forceful sound of the amplified harp rather than dazzling displays of dexterity. Appelrouth proves an ideal accompanist, he too favoring subtle, tasteful licks that fit just right rather than grandstanding exhibitions of his considerable abilities. The collection mines familiar territory – most compositions fall squarely into twelve-bar territory, with a couple of belly-rubbing ballads for variety. Covers include Louis Jordan’s “Buzz Me,” and closer “C’est la vie,” a rollicking romp originally from Chuck Berry. Elsewhere the program mixes Chicago and jump blues with hints of rock ‘n’ roll, music designed for dancing and good times. Owens and Appelrouth show they're anyone's match at acoustic blues on “Screaming And Crying,” a hard-driving duet, and get down ‘n’ dirty on instrumental “Late Nite Blues.” Owens’ harp tone on the latter is exemplary, thick and nasty and packing an almost palpable physical punch. Appelrouth is utterly unerring throughout, with a broad tonal palette to match any style, whether it’s crunching chords or delicate, single-string leads. The band is strong – bassist John Sheppard, drummer Mark Young, and pianist John Fralin know how to keep it loose while locking tightly onto any given groove, and a handful of guests help round out the sound and add a bit of variety. Owens isn’t blessed with a particularly strong voice – it’s a bit on the thin side – but his laconic vocals suit the material just fine. Rather than a feral growl he affects an easygoing, everyman vibe with more than a hint of humor in his delivery. It doesn’t work quite as well on the tearjerkers but he’s effective indeed on the livelier material that comprises the bulk of the playlist. In the end, he’s a seasoned veteran who knows how to work with what he’s got, and comes across as an old pro who’s still got all the hunger it takes to make the blues matter.